ATTENTION ALL PERSONNEL: CAD at dispatch is going through version upgrade tomorrow 1/30/2016 from 0800-2000. As a result, Code Messaging/CAD Page will not function during those hours. Please insure that you are monitoring the Fire-Rescue Dispatch talkgroup or using CCFR Page talkgroup/V-Mute function on your radio. Your phone will not receive automatic incident notifications from the CAD until the version upgrade is complete. 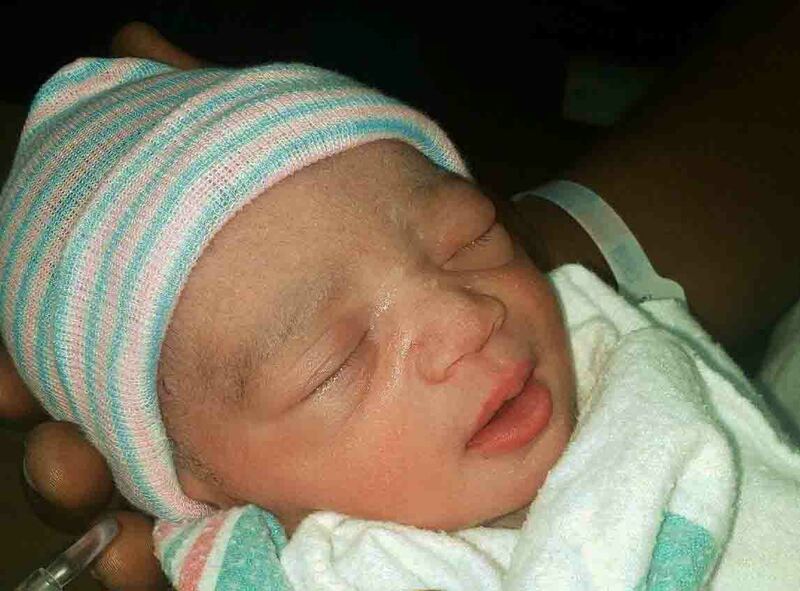 We congratulate Firefighter-Paramedic Dwayne Greene and Erica Salter on the birth of a daughter, Sierra Tiana Greene. Sierra was born at 02:58 this morning and weighed 4 lbs., 7 oz. Both mom and baby are doing fine. 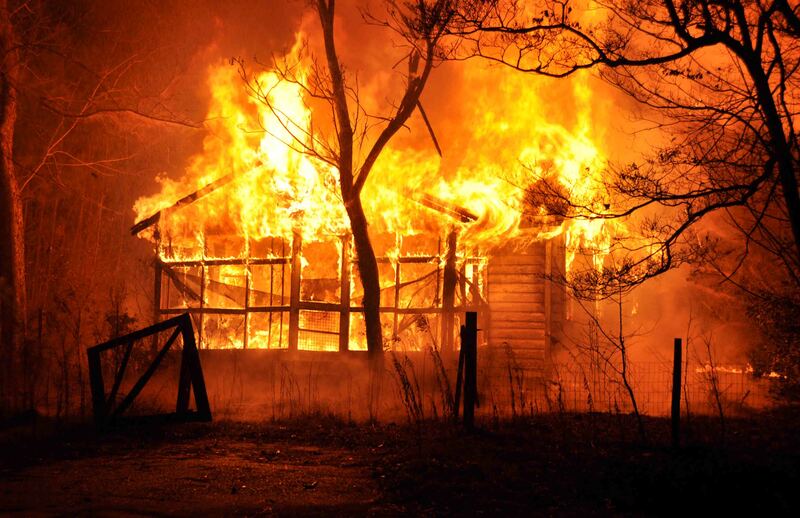 A Renee Court home was destroyed in a Saturday evening blaze 23-Janaury. At 20:34, several callers reported seeing flames coming from a residence near the intersection of Robertson Blvd and Renee Court south of Walterboro. Car 118 arrived four minutes later to find the single story wooden structure fully involved. Engine 1 initially used a deck gun to knock down the flames while crews deployed handlines to the building. Two 1-3/4 handlines were used to extinguish the fire. Click here for more information. A Ritter family was displaced following a fire in their home Saturday afternoon 23-January at 13:28. 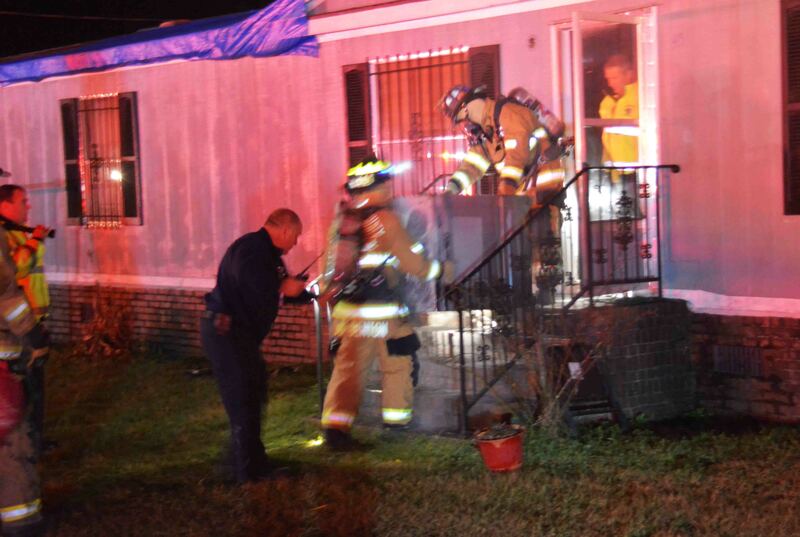 The fire at 1496 Saxby Hill Road caused heavy damage to the doublewide mobile home. Engine 6 arrived minutes after dispatch to find heavy fire conditions in a one room addition at the rear of the residence and fire coming from the eves on one end of the structure. Crews deployed one 1-3/4 handline to the rear of the building and began a defensive attack. They were able to quickly knock down most of the fire in the addition. Click here for more information. 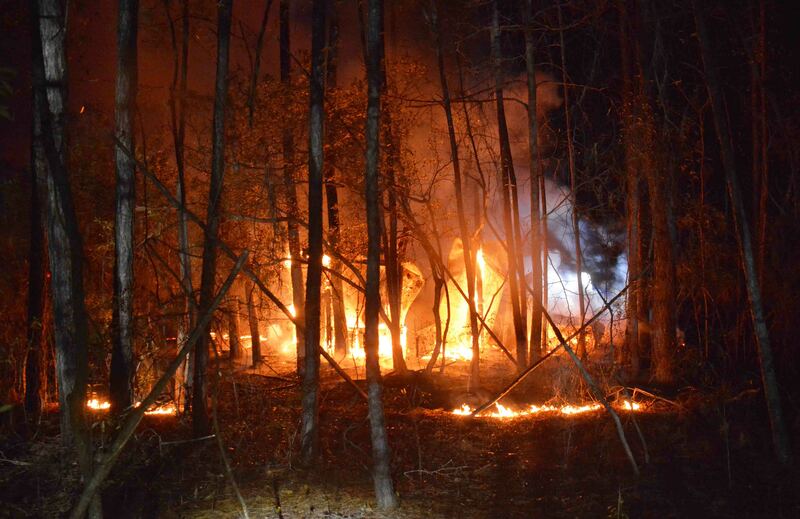 An abandoned house was destroyed and approximately ½ acre of woods was burned in a suspicious fire that occurred Wednesday evening 20-January. At 20:02, Fire-Rescue units were sent to the 100 block of Harrison Drive for the report of a woods fire with a possible building involved. Engine 19 arrived three minutes later to find what appeared to be a large debris fire 200 feet in the woods. Upon inspection, firefighters discovered the remains of a wooden structure which appeared to have been abandoned for many years. Click here for more information. At 17:08, Tuesday afternoon 19-Janaury, Fire-Rescue was sent to a structure fire at 72 Shelby Lane, located in a rural community west of the Town of Smoaks. The initial caller to 9-1-1 reported smoke and flames coming from the residence. 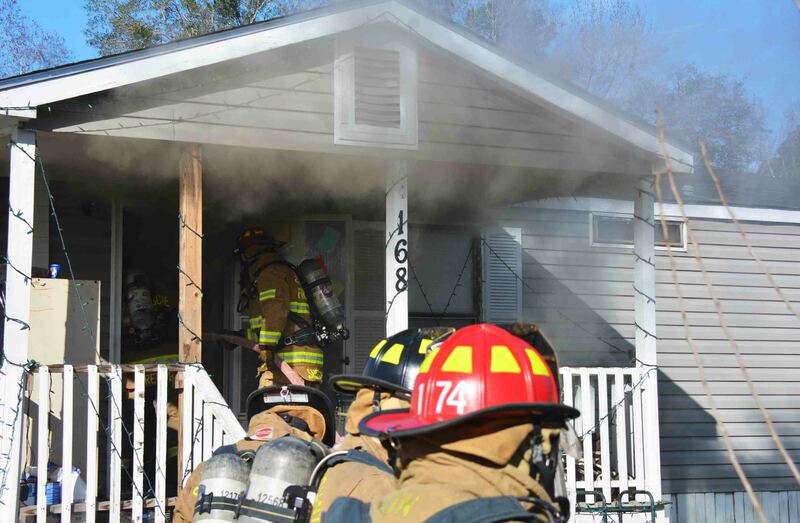 The caller advised there was a man inside the home and her husband was attempting to get him out, but was driven out of the building due to the smoke. 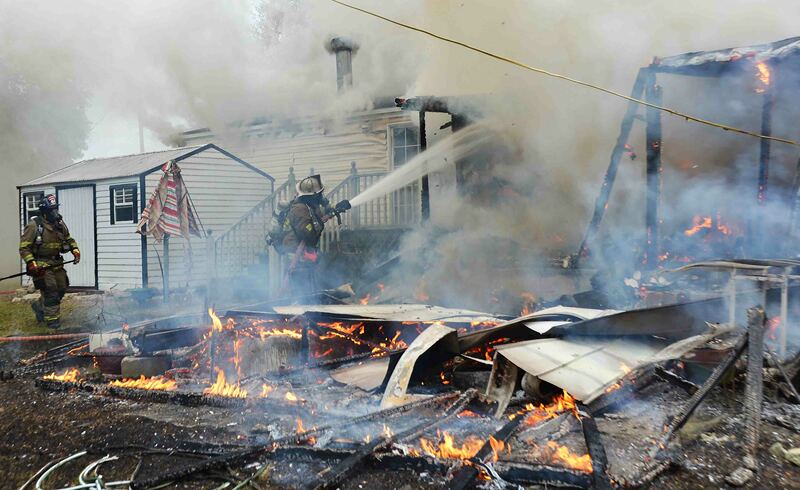 Engine 7 arrived seven minutes later to find heavy smoke coming from the doublewide mobile home. Click here for more information. 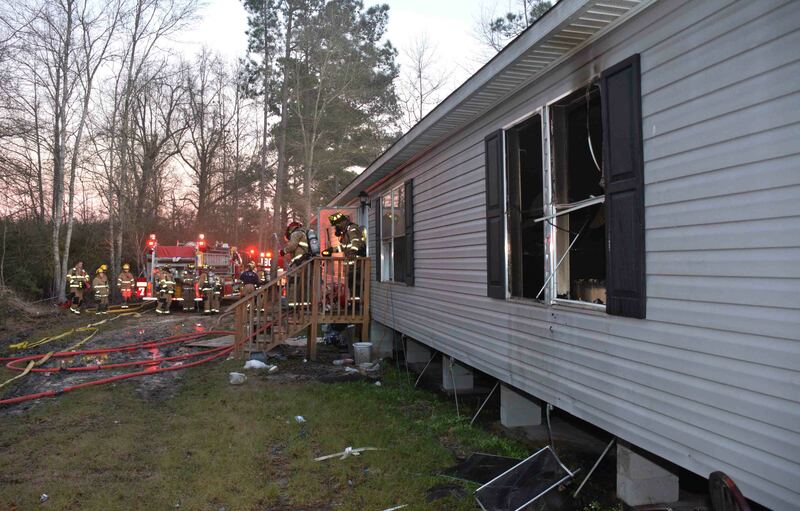 At 10:30 Monday morning 18-January, 9-1-1 began receiving multiple calls about a residential fire at 20530 Augusta Hwy. 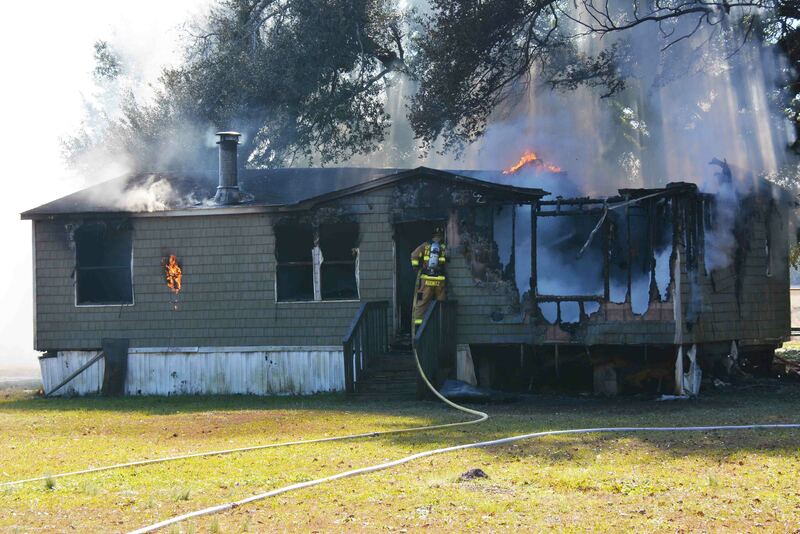 (SC Hwy 61) Callers stated that flames were coming from the roof and windows of the home. Engine 36 arrived minutes later and reported a well involved double wide mobile home. Firefighters deployed multiple handlines to the structure and set up a drop tank for water supply. The occupant was on the scene and told firefighters everyone was out of the building. Click here for more information. A grease fire on the stove cause minor damage to a kitchen and filled the home with smoke Sunday evening 17-Janaury. The fire occurred at 451 Griffin Street in the Town of Williams. At 22:28, 9-1-1 was notified of the fire in the kitchen of the home. A Sheriff’s Deputy arrived minutes later and attempted to extinguish the blaze. He advised the fire was increasing and running up a wall. Engine 18 arrived to find light smoke coming from the doublewide mobile home. Crews used an ABC extinguisher to douse the flames. Click here for more information. A high speed single car MVC injured a 33 year old man Sunday afternoon 17-January. 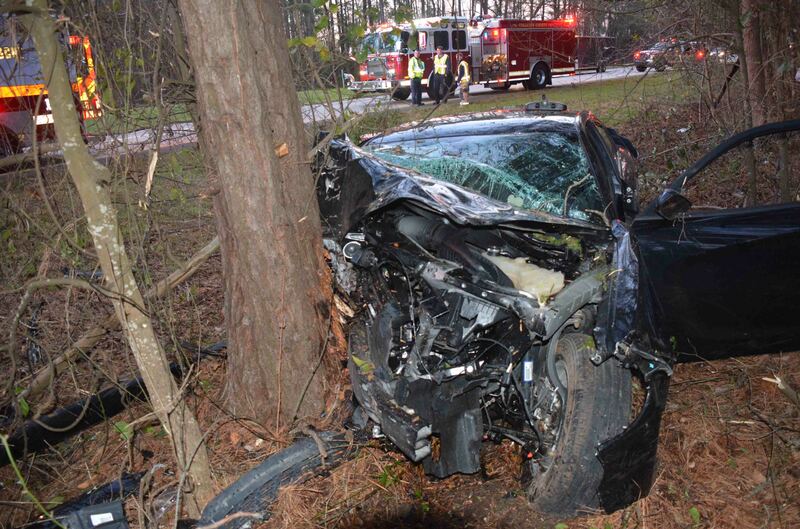 At 17:23, Colleton 9-1-1 received several reports of a Dodge Charger the left the roadway and struck a tree in the median. Some callers reported the driver was trapped. Medic 13 arrived to find the car with heavy damage in the median. The driver was conscious but confused, however he was free from the wreckage. He suffered multiple traumatic injuries, including a possible head injury. Click here for more information. A 55 year old woman received non-life threatening injuries after a truck she was driving over-turned on I-95 Saturday afternoon 16-January. At 16:52, Fire-Rescue was dispatched to the 57 mile marker for an accident involving an over-turned tractor trailer. No accident was located at the 57. Units continued north for approximately 4 miles and located the accident near the 61 mile marker southbound. A Budget boxed style truck lost control and rolled onto the driver’s side. The female driver was tangled in the steering wheel and covered by contents in the cab. Click here for more information. A 33 year old man was in critical condition after he was shot twice in the back during a reported domestic dispute in the 600 block of Stokes Road Friday afternoon 15-Janaury at 14:22. Sheriff’s Deputies arrived quickly, took a subject into custody, then cleared the scene for Fire-Rescue. The man was located inside the mobile home. Firefighter-Paramedics rapidly assessed and began treating the patient. 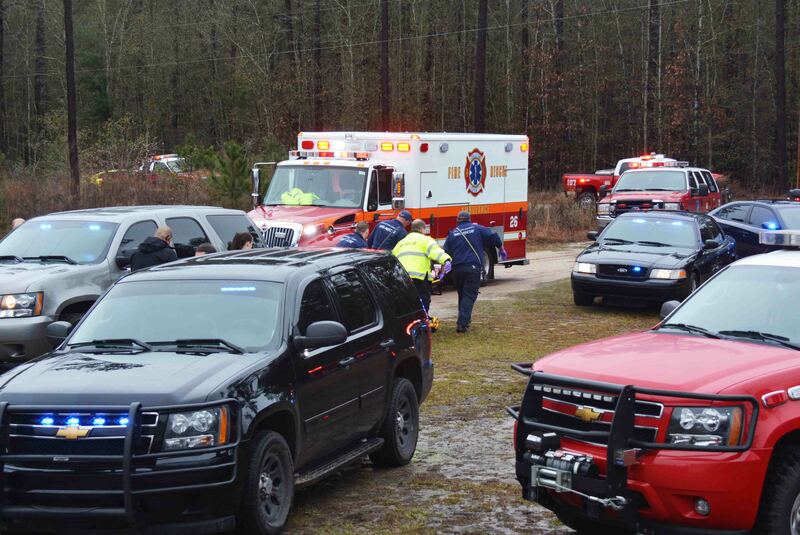 A medical helicopter was requested, but denied the flight due to poor weather conditions. Click here for more information. At 09:55 Tuesday morning 12-January, a two car collision resulted in one vehicle over-turning in a deep ditch at the intersection of Green Pond Hwy. (SC Hwy 303) at Woodland Terrace Drive. The adult female driver was wearing a seatbelt. Responders found the patient partially on the ceiling restrained by the seatbelt. The woman suffered non-life threatening injuries. Firefighter-Paramedics stabilized the vehicle with cribbing, then forced open the doors. Click here for more information. A 38 year old Florida man suffered a head injury in a fall at a truck stop located at 11109 Augusta Hwy (SC Hwy 61) Sunday afternoon 10-Janaury at 14:51. A truck stop employee found the man unconscious in the parking lot with a bleeding head wound and called 9-1-1. Firefighter-Paramedics arrived about 10 minutes later. The man was conscious when crews examined him, but suffered a significant injury. 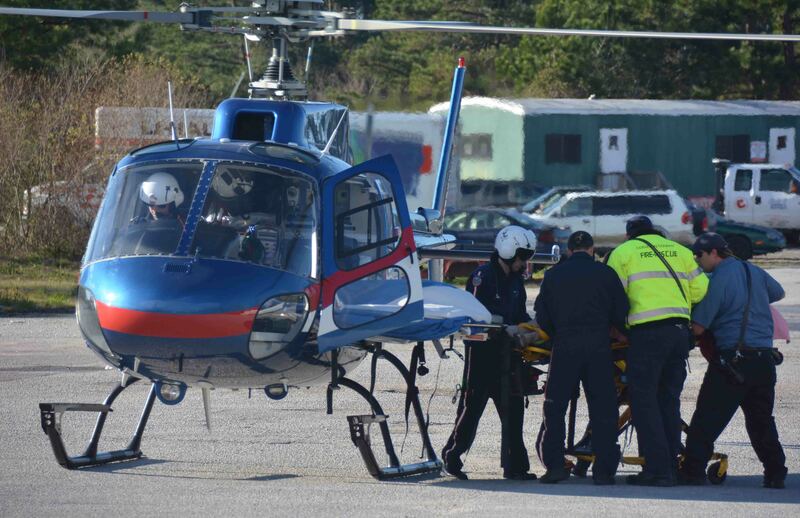 A medical helicopter was called and LifeNet 4 responded to the scene, landing in the parking lot. Click here for more information. 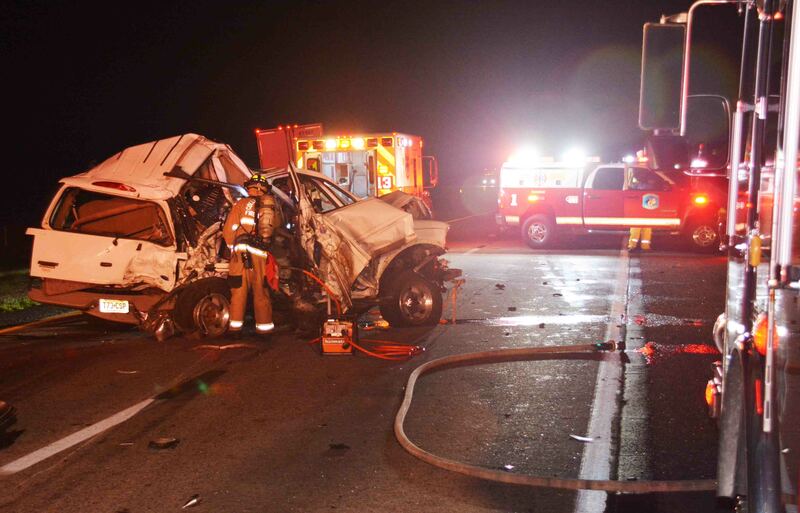 Two people were injured in a three vehicle crash involving a tractor trailer on I-95 near the 45 mile marker southbound, Friday evening 08-January. At 22:22, 9-1-1 operators received the report of the multi-vehicle accident. The initial caller advised two people were trapped in separate cars. They stated a SUV was in the middle of the highway and a tractor trailer was in the median. Medic 13 arrived 5 minutes later to find the south bound lanes under the Combahee Road overpass blocked by vehicles and debris. Click here for more information. Firefighters saved a residence at 168 Palm Street Thursday morning 07-January. At 09:59, a Water Dept employee working near the intersection of Palm and Doyle Streets noticed smoke coming from the roof of the residence and notified 9-1-1. Engine 1 arrived to find light smoke coming from the eaves of the doublewide mobile home. Neighbors advised no one was at home. Firefighter-Paramedics made entry through the front door with one 1-3/4 handline and found fire burning near the rear door of the home. Click here for more information. 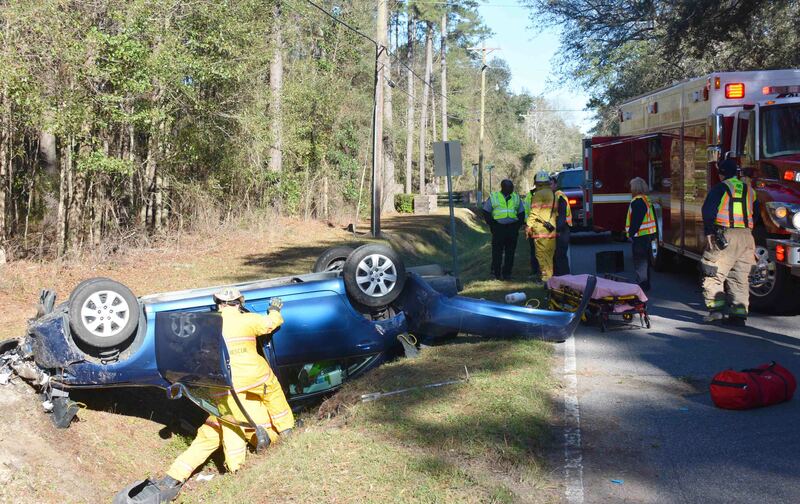 A two vehicle MVC in the 700 block of Bells Hwy claimed the life of a 61 year old Walterboro man Monday afternoon 04-January and blocked the busy highway for close to an hour. 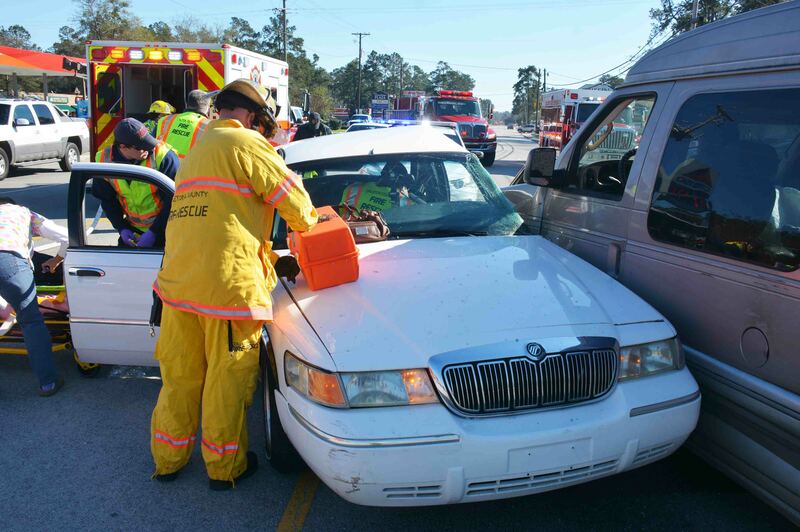 At 13:27, a Mercury Grand Marquis and a Full-sized Ford Van collided in front of a shopping center. The Marquis was struck in the driver’s side causing approximately 1-1/2 feet of intrusion into the interior. Two front seat passengers received critical injuries and the driver was trapped in the wreckage. Click here for more information. 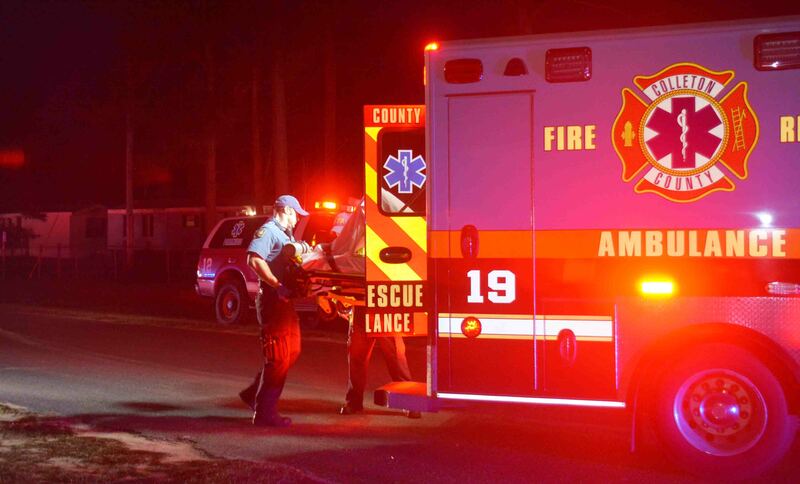 Two people received gunshot wounds in an early morning incident at 106 Keegan Drive north of Walterboro, Sunday morning 03-January. The two adults where inside the residence when an unknown subject fired multiple rounds into the home. The male received life threatening injuries to his torso, while the female received a non-life threatening injury to her leg. Firefighter-Paramedics treated both patients at the scene and called for a second ambulance. Click here for more information.